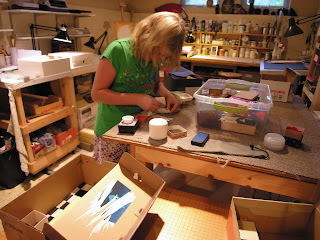 When my ten-year-old granddaughter, Sterling Knight, visited for a week, we spent much of our time in my studio. 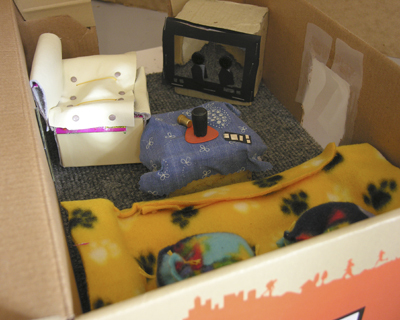 She arrived with Fluffy, a cunning, lavender-plush, weasel-like toy pet who needed a house. As it turned out, Fluffy actually needed a contemporary, four-story condominium with a private elevator and garage for the red convertible Sterling would make for her/him. Beyond the satisfaction of using odds & ends, materials, and saved objects for which I could not imagine any use but had kept anyway, the real delight was watching Sterling work. She is deft and understands how to put things together. She sees possibilities and has an intuitive sense of structure and proportion. What I really admired, however, was the way she did not self-edit. There was no "This looks all yukky and stupid." If a chair made of boxes, scrap leather, cotton balls, and brads was a little wonky, she accepted it and moved on to construct a big-screen television. The home was packed with imagination, clever ideas, originality, and fun. Above all she worked with enthusiasm and self-confidence, making what she wanted to see, making what would give Fluffy pleasure. Any artist can learn a lesson from this young girl. Thank you! This was just what I needed this morning as I head out to the studio. This is one of the reasons I grew when I taught elementary art students for more than 25 years. It was post grad school. What I wonder, Carole, is how you kept track of the materials in the art rooms. As quickly as I produced stuff for Sterling's speedy fingers, I was trying to put other things away so we could keep our heads above fabric/glue/paper/tools water! I also can't imagine how you gave attention to so many kids at once. What a gift you gave those children.